Manila, January 15 2014 : LSIS South Korea (www.lsis.com), a leading company in Electric Power and Automation Solutions, as part of its corporate social responsibility has donated One Million Pesos for the relief operations of the recent super typhoon Yolanda. 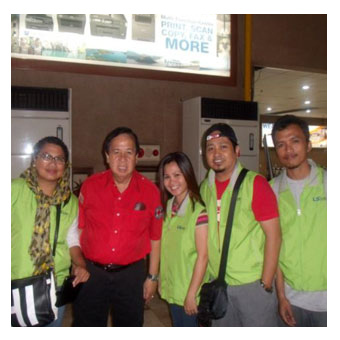 The mission was done thru its Philippine partners, Yu Eng Kao Electrical Supply,Inc. (www.yuengkao.com) and Fuji-Haya Electric Corporation. Shown in picture are team members, on their way to distribute aid packages to the devastated towns of Ormoc, Tunga, and Tolosa Leyte, together with Philippine National Red Cross (PNRC) chairman; from left to right: Esfe Batal, PNRC Chair Richard Gordon, Ruby Cubian, Dayson Buenaventura and Jerald Guadiana.